Note: these notes are tailored to the Arduino Mega board with an atmega2560 processor. There are complementary notes for the atmega8. For class, the following files can be found in your svn tree. If you are not using this tree, then grab a current version of OUlib: libou_atmega2560.a and oulib.h and place it in your project directory (or place a shortcut to these files in your project directory). Also download oulib_serial_buffered.h and buffer.h. See the AVRstudio discussion (NOTE: AVAILABLE SOON). text region full: Make sure the "optimization" flag is set (see above). You will probably also need to re-add "F_CPU"
Oulib error: F_CPU not defined. Re-add "F_CPU" as above. After this, perform a "build clean" and a "rebuild all"
Many things undefined, such as DDRB and PORTB. Re-set your device to "atmega2560"
Change the TARGET = led_flash.c line so that it contains the name of your source file. Use the "cd" command to change directory to the location of your makefile and source file. If you run into device permission problems, you can do this as root as a temporary measure (to configure for standard user use, you must configure udev properly). To fix this permanently, see the installation page. You may use the original mega2560/first_circuit.sch file if you wish (this is an Eaglecad file). L1 and L2: LEDs used in the sample program. Note that the polarity of the LEDs is critical. You need a resistor in series with each of the LEDs (1K ohms will do). You can also download the oulib source and examples: oulib_2012_02_14.tar. 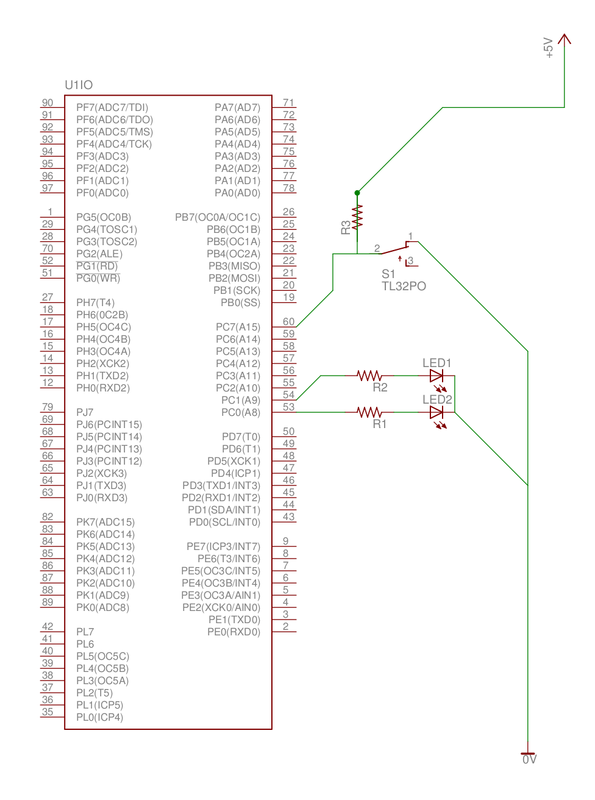 Suha has a tutorial on manipulating ports on the Atmel (note that this is a slightly different processor than the mega8, but the principles are the same). OUlib Module Documentation. We will make heavy use of this document in the class. AVR Lib Manual. You may find the AVR Lib Manual in PDF more useful.